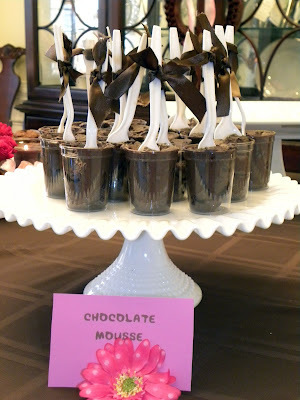 To celebrate Kalle's little girl, I focused on chocolate...you would think it's just a pregnancy craving for Kalle, but in fact, it's 24 hours a day/7 hours a week/pregnant or non-pregnant craving. The girl loves chocolate. Chocolate Brown and Pink was the color theme, and it turned out adorably! 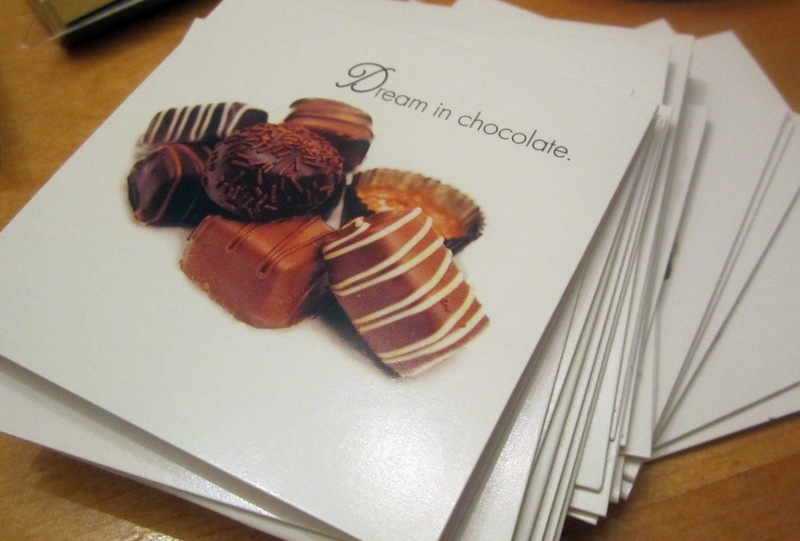 Let's smell the chocolate, shall we? 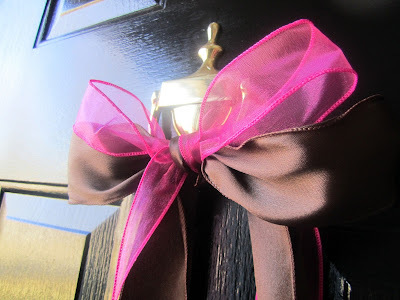 Welcomed by a pink and brown bow, guests were welcomed into their very own chocolate factory! 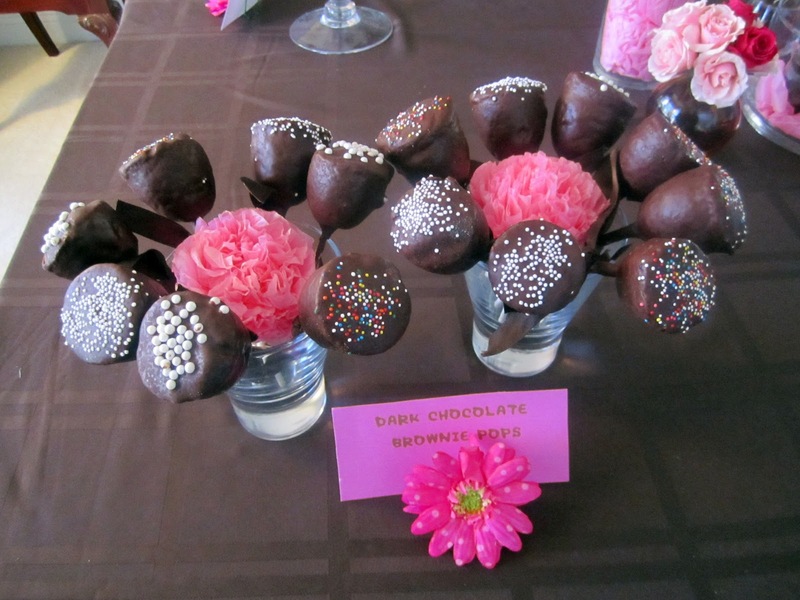 On the menu at the chocolate feast? 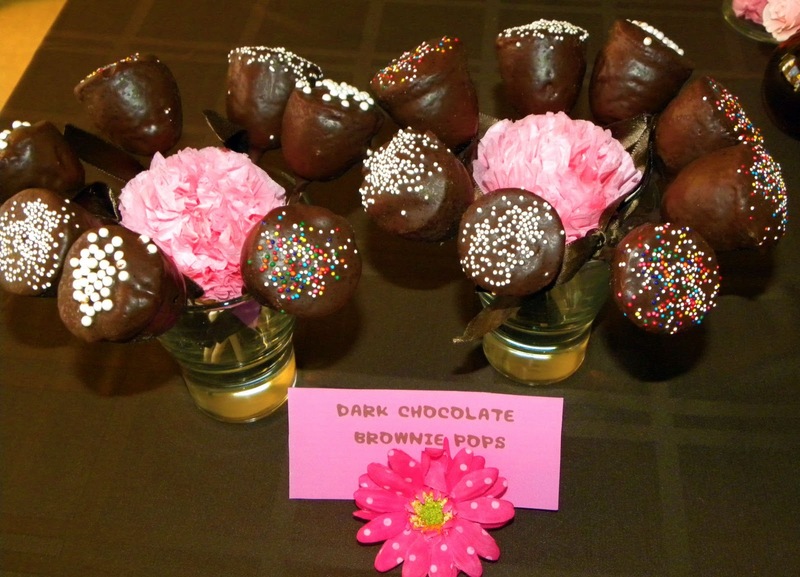 Dark chocolate Brownie Pops - I tried my hand at these, and I have to give Bakerella props for making all those cake pops! How do you dry the pops without having the chocolate drip down the side of the stick? Honestly, if they weren't so cute, I would never make them again. Chocolate everywhere!! Fyi, when melted chocolate dries on the counter in a hidden spot and you don't find it until the next day, you basically need a hacksaw to get it off. 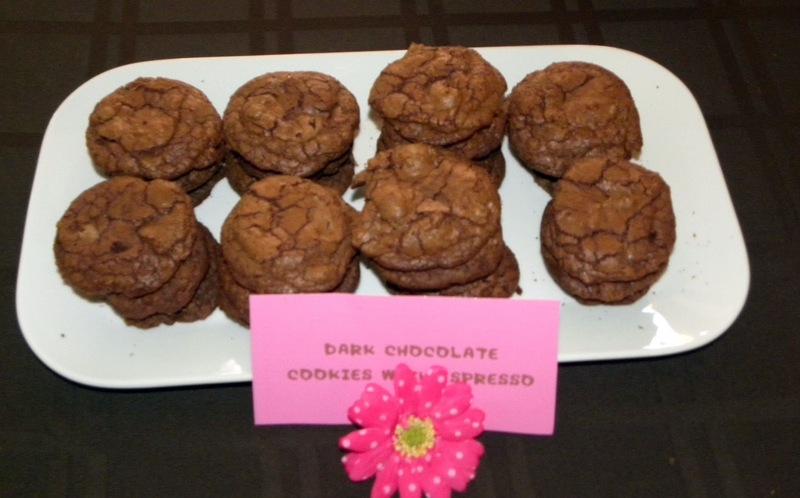 Dark Chocolate Chunk Espresso Cookies - by Martha. These were absolutely excellent...the espresso brings out the dark chocolatey goodness. I am going to do a separate blog this week with all the recipes, so don't fret. 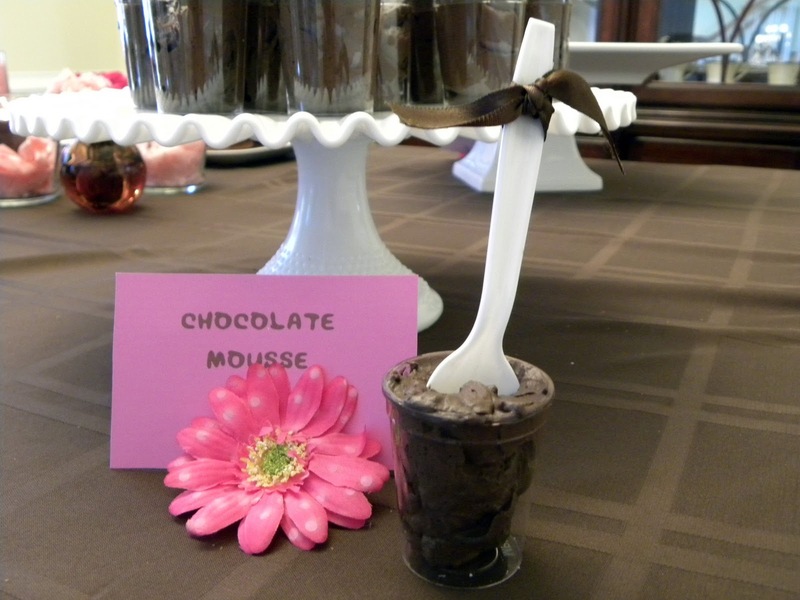 Individual chocolate mousse anyone? 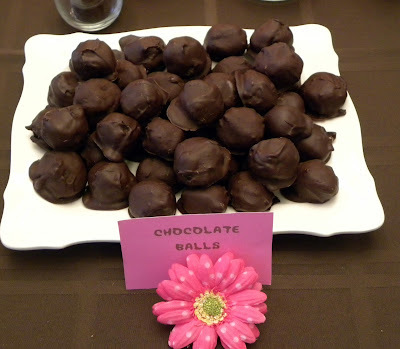 This recipe is from Hershey's, and was SO easy. Again, more on these recipes later this week. I spooned the mousse into shot glasses and served them individually with a spoon. A perfect mini size for a rich treat! My fab friend Hillary made chocolate balls - essentially, these are balls of chocolatey goodness. Pretty self explanatory. 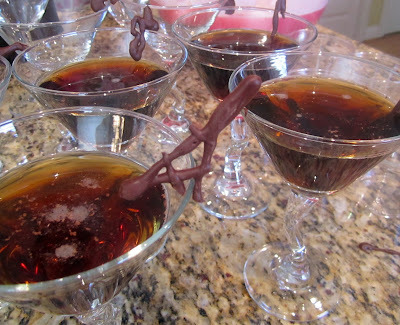 Chocolate cocktails? Yes please. Thanks for the recipe Emeril - BAM! I added an abstract glass garnish by piping melting chocolate onto a foil covered baking sheet. Stick it in the freezer for an hour and you have a hardened chocolate accoutra-mon (accoutrement) for your glass. Cool yo. There was also a fabulous chocolate cake, but I didn't get a good picture of it...probably because it was scarfed down asap due to extreme deliciousness. Recipe to come. There was even some non-edible chocolate. 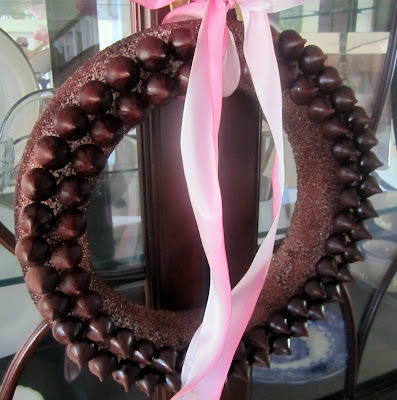 I created a chocolate wreath using a Styrofoam wreath form painted brown, unwrapped hershey kisses, super sticky glue (thanks for the suggestion Amanda!) and glossy brown spray paint. 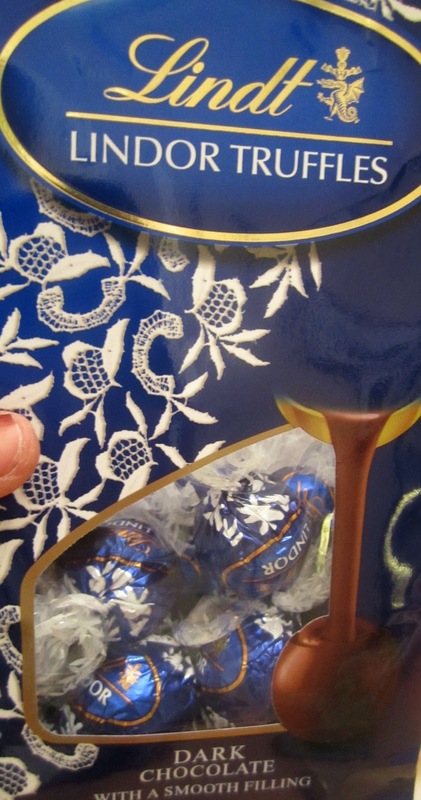 The glossy spray paint added a lot of sheen to the chocolate. 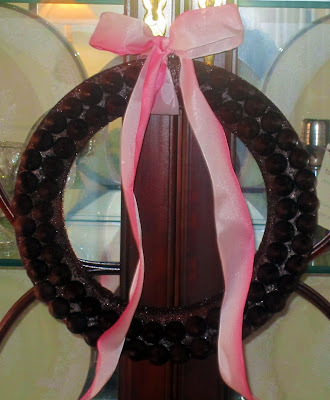 Without that finishing touch, the wreath looked dull. For a simple centerpiece, I arranged small brown bud vases with pink spray roses and clustered them around glass containers with pink tissue paper and brown candles. So simple and pretty! I love the color combo. On another table, I used chocolate brown frames to showcase various pictures of chocolate sayings, vintage advertisements, and posters. 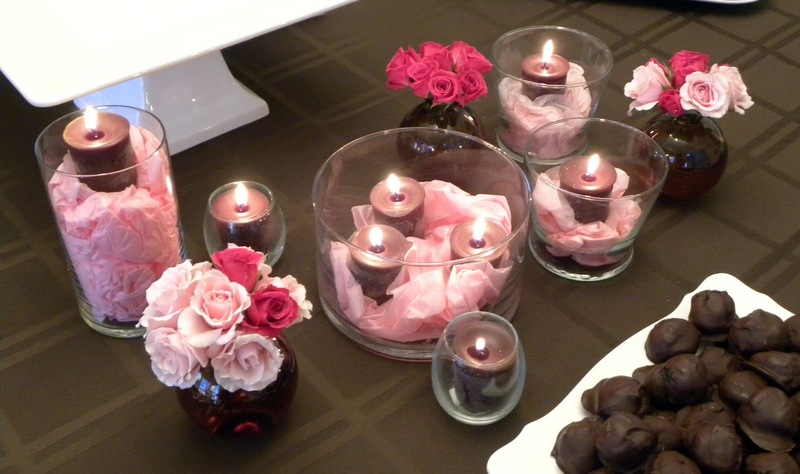 On this table I put a cheese platter and a veggie platter - a fantastic idea for a chocolate party...you need something NOT chocolate to snack on, I promise! 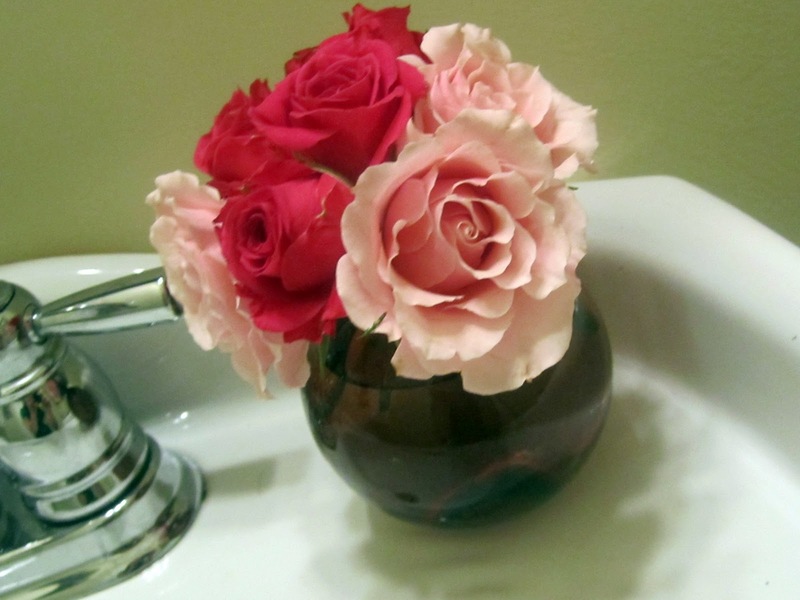 Of course there was a signature Jackie Fo bathroom flower...really brightens up your trip to the powder room, I've got to tell you. 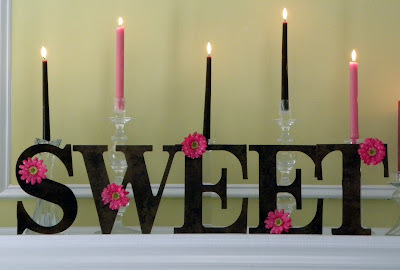 As if the guests didn't know that chocolate and babies were sweet, I created a mantel display to remind them. 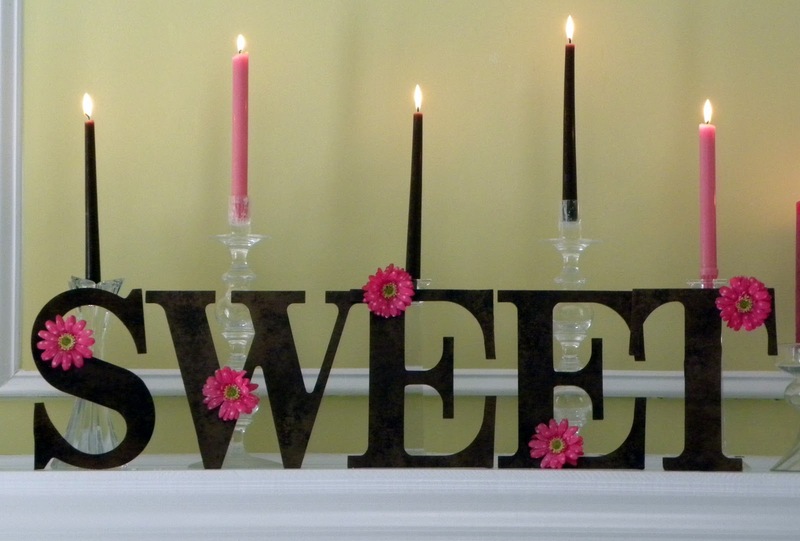 Kalle is going to put these letter's in the baby's room...isn't that SWEET! 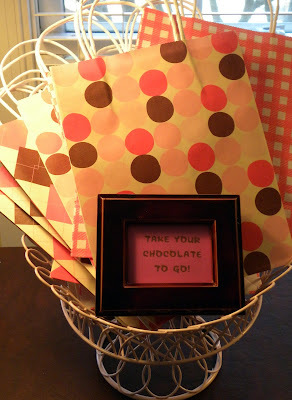 For favors, guests took home the chocolate treats in to go bags...my waistline thanks you. 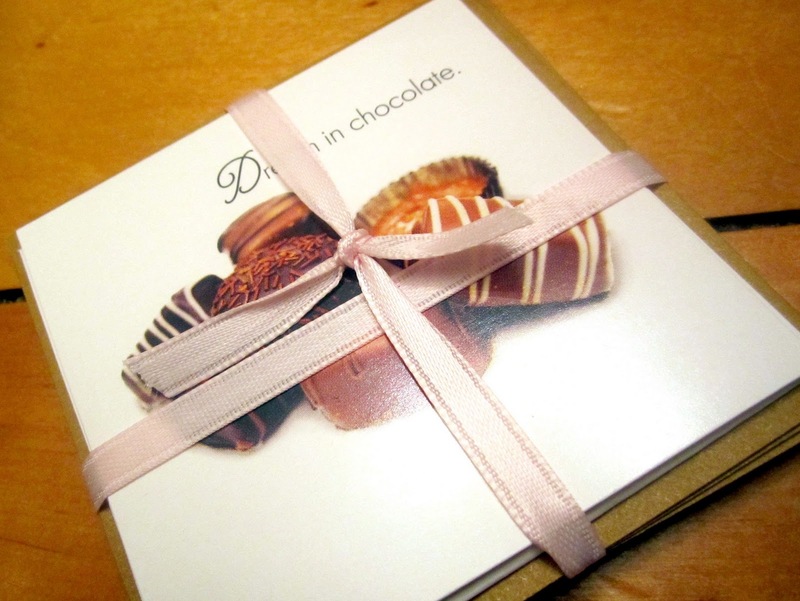 ...and these cute pink favor bags. 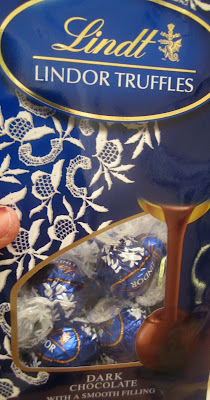 ...and of course chocolate truffles, because everyone really needed to take more chocolate home. Now go get yourself some chocolate...and as I said, come back this week for all of the chocolate recipes! Oh heaven...thanks looks like a fabulous party with lots of awesome sweets : ) You out did yourself with the food, yum!! Mmmmmm, chocolate! While I enjoy a good chocolate fix, I agree that there can be too much of a good thing. This looks like it was just adorable and delicious all together! I need a glass of milk now. That is A LOT of chocolate!! Everything came together beautifully. wow! what a great sprinkle! I didn't understand the overdosing on chocolate thing at first, but now I do! 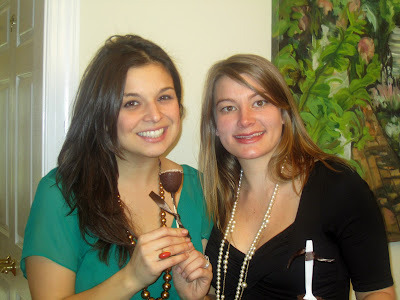 PS Is your necklace chocolate too? 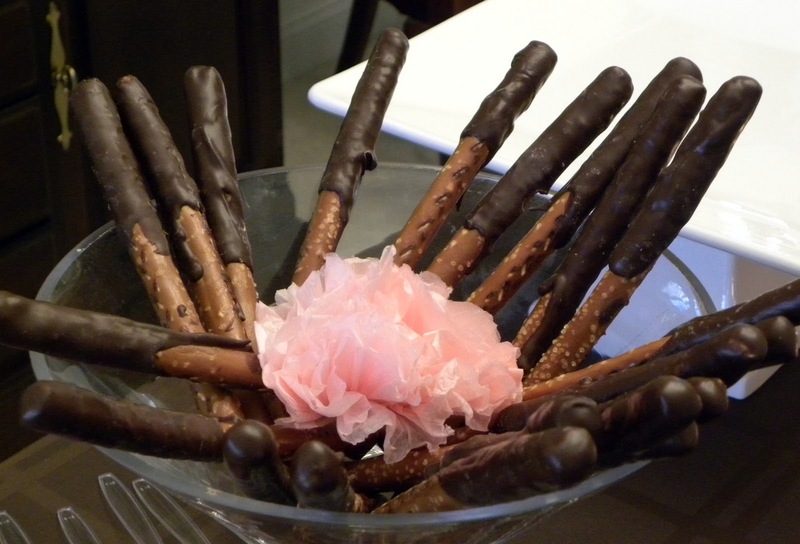 What could be better than chocolate! Great job! Fantab as always!! Love all of it! !